Bath welcomes the world’s most travelled boot! You are being invited on a journey from Cairo to Burma to Chicago and Jamaica, across Death Valley in California, to 1960’s Paris and Weston-super-Mare! 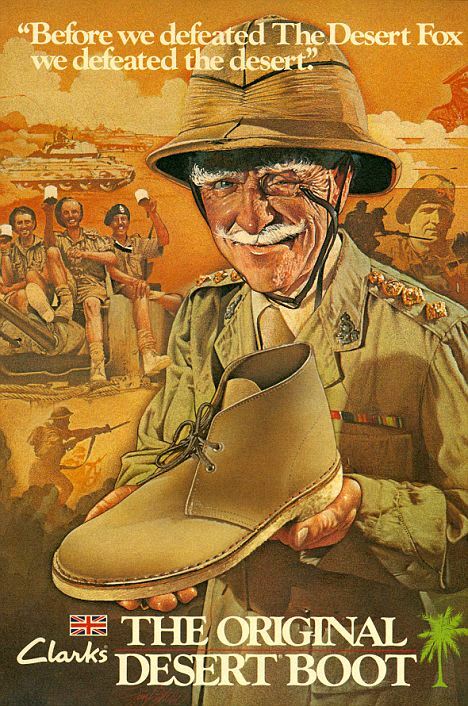 Clarks has sold more than 10 million pairs of Desert Boots in over 100 countries and the boot rightly deserves its place as one of The 50 Shoes that Changed the World as well as its title of the World’s Most Travelled Shoe. 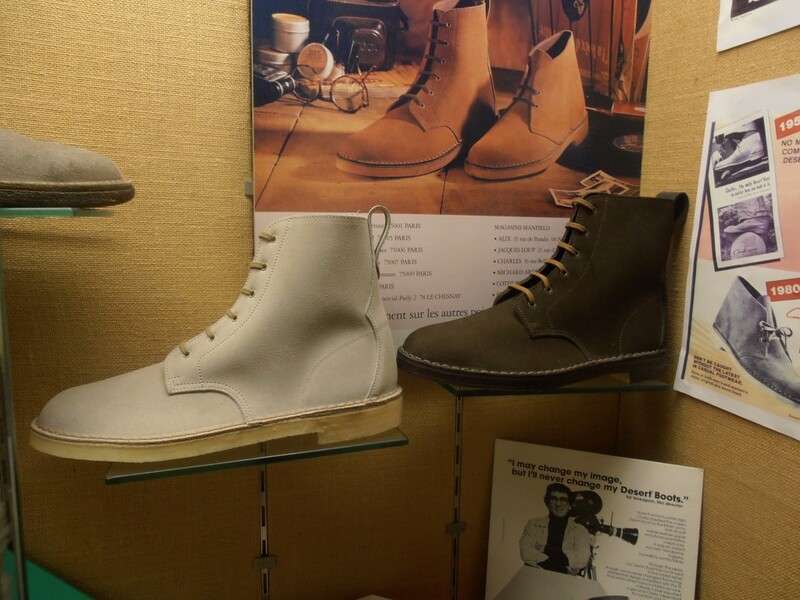 To celebrate the 65th anniversary of this British icon The Shoe Museum – in collaboration with The Museum of Bath at Work – is presenting the story of the Desert Boot in a new exhibition. The exhibition runs from Friday April 10th until Saturday October 31st and will begin with the origins of the Desert Boot which was designed in 1949 by Nathan Clark and modelled on a style made in the bazaars of Cairo. A year later, at the Chicago Shoe Fair, Nathan Clark transformed his stand into a desert oasis. Unconfirmed reports say he used tons of sand in the process. Women dressed as belly dancers present the Desert Boot on a silk pillow and a legend is born. Often imitated but never bettered, the Clarks Desert Boot is an enduring symbol of everything from teddy boy pomp and euro-chic to 60s flamboyance, Cool Britannia and 21st century swagger. The exhibition will tell the story of the people who designed the Desert Boot, the people who made them and the people who wear them. Visitors will be able to find out how this iconic boot has been adopted by Jamaican Rudeboys and Mods and 1960s Parisian students who loved Les Clarks, and was reinstated as a British classic during the Britpop era of the 1990s. In 2015, the popularity of the desert boot shows no sign of waning. No doubt drawn to its unisex, cross-generational appeal, the wealthy and famous are photographed daily in this iconic item of footwear. Wearers have included actors Steve McQueen, Robert Mitchum, and Kirk Douglas, Magnum photographer Don McCullin, and more recently Liam Gallagher who collaborated with Clarks and designed bespoke desert boots as part of his Pretty Green collection. Sarah Jessica Parker has been seen buying Desert Boots and Florence Welch, Emma Watson and Keira Knightly are also fans. The exhibition will also include visitors’ stories and we would like people to contact us to tell us about their Desert Boots. Anyone who visits the exhibition wearing Clarks Desert Boots will get a £1 reduction on their admission ticket! There will also be a series of events linking in with the themes of the exhibition including film nights, talks, activities for families and children, and some Egyptian themed events are also being planned. Project curator Dr Pam Walker from the Shoe Museum, said: ‘Desert Boots are so iconic and it wasn’t until I started researching this exhibition that I realised the major role they have played in popular culture The exhibition will tell lots of stories about who made these boots, the designers, and more importantly the people who wear them.